Indexes make organization easy. 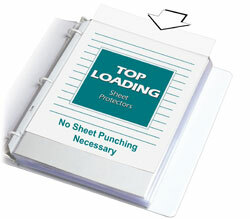 A top loading polypropylene sheet protector and index all in one! Now you don't have to buy oversized indexes separately. Use to index ring binders. Eight colored tabs. Sheet protectors with index tabs are an excellent way to organize yourself instantly. Acid-free protection. Includes laser/inkjet printable tabs. Insert size: 11x 8 1/2. 8/ST.